The UUCP Inclusion Team is thrilled to announce a week of conversation and exploration on how UUCP can live into our commitment to be a radically inclusive spiritual community for our time. We are excited to welcome Rev. Mykal Slack and Zr. Alex Kapitan of the Transforming Hearts Collective to facilitate these experiences. In the last several months UUCP’s leadership and many members have been grappling with how to live out our vision of being a radically inclusive spiritual community for our time, particularly with respect to trans inclusion. We’ve learned that radical inclusion requires far more from us than simply opening our doors to trans people. It requires transformation: transformation of ourselves and our awareness, transformation of our congregation and its culture, and transformation of our wider community and world. On February 3, we will literally transform our two worship services into a single experience that engages our hearts, minds, and spirits in the work of radical inclusion. Bring an open mind and a willing heart and join Rev. Mykal Slack, Zr. Alex Kapitan, and the UUCP choir for an experiential morning that you will definitely not want to miss. Rev. Mykal Slack and Zr. 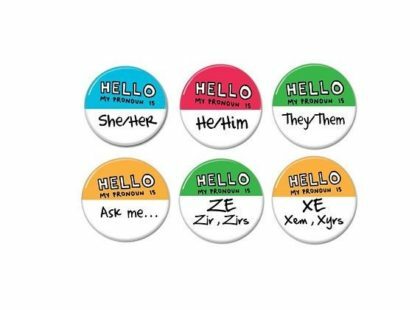 Alex Kapitan are excited to meet up with everyone and anyone from the UUCP community who is trans, non-binary, intersex, gender non-conforming, gender questioning, and/or doesn’t use gender labels for themself, in advance of being with UUCP in person on Feb 2-3. This will be a multigenerational online video space to be together as trans and gender expansive community and talk about spirituality, gender, our experiences in Unitarian Universalism, and anything else that’s on our hearts. Anyone under the age of 19 who would like to attend is warmly welcomed to join us, regardless of identity. Rev. Mykal and Zr. Alex are eager to learn from UUCP’s YRUU group and honor their leadership in the congregation. The whole YRUU group will meet up with Mykal and Alex for delicious treats and conversation about youth leadership, gender, what UUism would look like if teens ran the world, and more. We might even play gender bingo! Following our transformational working service, Rev. Mykal and Zr. Alex will be facilitating a conversation with UUCP leaders over lunch. Everyone has a part to play in transformation, and leaders have particular roles and responsibilities in supporting UUCP in living into its vision of being a radically inclusive spiritual community for our time. UUCP leadership will be gathering for some real talk about how UUCP can carry this vital ministry forward. Rev. Mykal Slack and Zr. Alex Kapitan are co-leaders of the Transforming Hearts Collective, a collective of trans and queer faith leaders who support faith communities in the ministry of radical welcome and transformational culture shift. 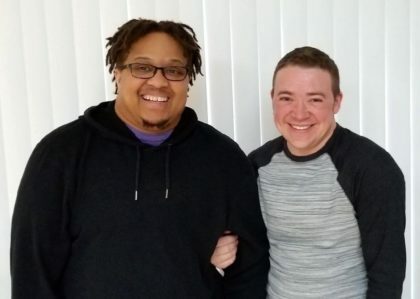 Mykal has worked in congregations and other faith settings for more than a decade, developing anti-oppressive frame-works for church life, offering pastoral leadership and educational resources on sexual orientation and gender identity, and fostering community life practices that embody radical welcome. He also serves as Community Minister for Worship & Spiritual Care for Black Lives of Unitarian Universalism (BLUU). Alex is a trainer, speaker, editor, activist, and lifelong UU who previously worked at the Unitarian Universalist Association supporting Welcoming Congregation, anti-racism, and social justice programming. Ze also serves on the steering committee of TRUUsT, an organization of trans UU religious professionals.